The large number of very small snail species from fresh and brackish water, which for the sake of simplicity usually are referred to as spring snails or mud snails, actually are a whole larger superfamily, the Rissooidea. 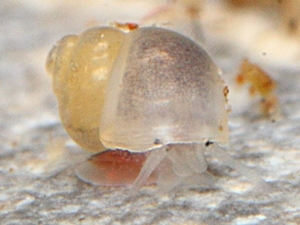 Recent molecular genetic research (Wilke et al., 2001) has yielded that spring snails in the narrower sense, for example the Bythinella genus, are not placed among the Hydrobiidae, but in a family of their own, the Amnicolidae, as a part of the Rissooidea. Actually Hydrobiidae on the other hand are mud snails (e. g. Peringia ulvae, the laver spire snail) and some other spring snail groups, among those, e. g. Belgrandiella pareyssii, the thermal spring snail, which shares the thermal springs of Bad Vöslau in Lower Austria with the thermal spring nerite (Theodoxus prevostianus) and the thermal spring pitch snail (Esperiana daudebartii). 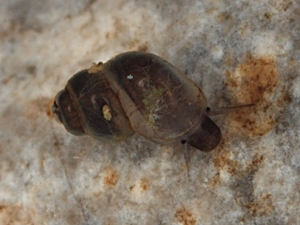 Also in the Hydrobiidae there is the New Zealand mud snail (Potamopyrgus antipodarum), a famous introduced snail species or neozoon. A third family finally contains the gravel snails (Lithoglyphidae) with the river gravel snail (Lithoglyphus naticoides). Natural History Museum Rotterdam: Hydrobiidae Shell Pictures. Also a part of the Rissooidea is the family of Bithynias (Bithyniidae), such as Bithynia tentaculata. The following table, found on each Rissooidea page, is supposed to make navigation and orientation between the respective pages easier. Bouchet, P.; Rocroi, J.-P.; Frýda, J.; Hausdorf, B.; Ponder, W.; Valdés, Á. & Warén, A. (2005). "Classification and nomenclator of gastropod families". Malacologia 47 (1 - 2): 1 – 397. Wilke, T.; Davis, G. M.; Falniowski, A.; Giusti, F.; Bodon, M. & Szarowska, M. (2001). "Molecular systematics of Hydrobiidae (Mollusca: Gastropoda: Rissooidea): testing monophyly and phylogenetic relationships". Proceedings of the Academy of Natural Sciences of Philadelphia 151 (1): 1 – 21.